For the magic periodical, see The Sphinx (magazine). The Great Sphinx of Giza (Arabic: أبو الهول‎, translit. ʼabu alhōl / ʼabu alhawl, IPA: [ʔabu alhoːl], English: The Terrifying One; literally: Father of Dread), commonly referred to as the Sphinx of Giza or just the Sphinx, is a limestone statue of a reclining sphinx, a mythical creature with the body of a lion and the head of a human. Facing directly from West to East, it stands on the Giza Plateau on the west bank of the Nile in Giza, Egypt. The face of the Sphinx is generally believed to represent the Pharaoh Khafre. Cut from the bedrock, the original shape of the Sphinx has been restored with layers of blocks. It measures 73 metres (240 ft) long from paw to tail, 20.21 m (66.31 ft) high from the base to the top of the head and 19 metres (62 ft) wide at its rear haunches. It is the oldest known monumental sculpture in Egypt and is commonly believed to have been built by ancient Egyptians of the Old Kingdom during the reign of the Pharaoh Khafre (c. 2558–2532 BC). It is impossible to identify what name the creators called their statue, as the Great Sphinx does not appear in any known inscription of the Old Kingdom and there are no inscriptions anywhere describing its construction or its original purpose. In the New Kingdom, the Sphinx was revered as the solar deity Hor-em-akhet (English: Horus of the Horizon; Coptic: ϩⲁⲣⲙⲁϣⲓ; Hellenized: Harmachis), and the pharaoh Thutmose IV (1401–1391 or 1397–1388 BC)[a] specifically referred to it as such in his "Dream Stele". Medieval Arab writers, including al-Maqrīzī, call the Sphinx balhib and bilhaw, which suggest a Coptic influence. The modern Egyptian Arabic name is أبو الهول (Abū al Hūl, English: The Terrifying One). Though there have been conflicting evidence and viewpoints over the years, the view held by modern Egyptology at large remains that the Great Sphinx was built in approximately 2500 BC for the pharaoh Khafre, the builder of the Second Pyramid at Giza. The circumstantial evidence mentioned by Hassan includes the Sphinx's location in the context of the funerary complex surrounding the Second Pyramid, which is traditionally connected with Khafre. Apart from the Causeway, the Pyramid and the Sphinx, the complex also includes the Sphinx Temple and Valley Temple, both of which display similar design of their inner courts. The Sphinx Temple was built using blocks cut from the Sphinx enclosure, while those of the Valley Temple were quarried from the plateau, some of the largest weighing upwards of 100 tons. A diorite statue of Khafre, which was discovered buried upside down along with other debris in the Valley Temple, is claimed as support for the Khafre theory. Egyptologist Thomas Young, finding the Khaf hieroglyphs in a damaged cartouche used to surround a royal name, inserted the glyph ra to complete Khafra's name. When the Stele was re-excavated in 1925, the lines of text referring to Khaf flaked off and were destroyed. Theories held by academic Egyptologists regarding the builder of the Sphinx and the date of its construction are not universally accepted, and various persons have proposed alternative hypotheses about both the builder and dating. Some early Egyptologists and excavators of the Giza pyramid complex believed the Great Sphinx and associated temples to predate the fourth dynasty rule of Khufu, Khafre, and Menkaure. Flinders Petrie wrote in 1883 regarding the state of opinion regarding the age of the nearby temples, and by extension the Sphinx: "The date of the Granite Temple [Valley Temple] has been so positively asserted to be earlier than the fourth dynasty, that it may seem rash to dispute the point". In 1857, Auguste Mariette, founder of the Egyptian Museum in Cairo, unearthed the much later Inventory Stela (estimated to be from the Twenty-sixth dynasty of Egypt, c. 678–525 BC), which tells how Khufu came upon the Sphinx, already buried in sand. Although certain tracts on the Stela are considered good evidence, this passage is widely dismissed as Late Period historical revisionism, a purposeful fake, created by the local priests with the attempt to certify the contemporary Isis temple an ancient history it never had. Such an act became common when religious institutions such as temples, shrines and priest's domains were fighting for political attention and for financial and economic donations. Gaston Maspero, the French Egyptologist and second director of the Egyptian Museum in Cairo, conducted a survey of the Sphinx in 1886. He concluded that because the Dream stela showed the cartouche of Khafre in line thirteen, it was he who was responsible for the excavation and therefore the Sphinx must predate Khafre and his predecessors—possibly Dynasty IV, c. 2575–2467 BC. 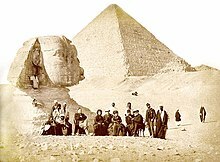 English Egyptologist E. A. Wallis Budge agreed that the Sphinx predated Khafre's reign, writing in The Gods of the Egyptians (1914): "This marvelous object [the Great Sphinx] was in existence in the days of Khafre, or Khephren,[b] and it is probable that it is a very great deal older than his reign and that it dates from the end of the archaic period [c. 2686 BC]." 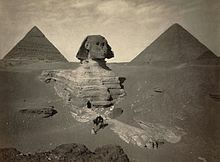 Maspero believed the Sphinx to be "the most ancient monument in Egypt". Rainer Stadelmann, former director of the German Archaeological Institute in Cairo, examined the distinct iconography of the nemes (headdress) and the now-detached beard of the Sphinx and concluded the style is more indicative of the Pharaoh Khufu (2589–2566 BC), known to the Greeks as Cheops, builder of the Great Pyramid of Giza and Khafra's father. He supports this by suggesting Khafra's Causeway was built to conform to a pre-existing structure, which, he concludes, given its location, could only have been the Sphinx. Colin Reader, an English geologist who independently conducted a more recent survey of the enclosure, agrees the various quarries on the site have been excavated around the Causeway. Because these quarries are known to have been used by Khufu, Reader concludes that the Causeway (and the temples on either end thereof) must predate Khufu, thereby casting doubt on the conventional Egyptian chronology. Frank Domingo, a forensic scientist in the New York City Police Department and an expert forensic anthropologist, used detailed measurements of the Sphinx, forensic drawings and computer imaging to conclude the face depicted on the Sphinx is not the same face as is depicted on a statue attributed to Khafra. In 2004, Vassil Dobrev of the Institut Français d'Archéologie Orientale in Cairo announced he had uncovered new evidence the Great Sphinx may have been the work of the little-known Pharaoh Djedefre (2528–2520 BC), Khafra's half brother and a son of Khufu. Dobrev suggests Djedefre built the Sphinx in the image of his father Khufu, identifying him with the sun god Ra in order to restore respect for their dynasty. Dobrev also notes, like Stadelmann and others, the causeway connecting Khafre's pyramid to the temples was built around the Sphinx, suggesting it was already in existence at the time. The Orion correlation theory, as expounded by popular authors Graham Hancock and Robert Bauval, is based on the proposed exact correlation of the three pyramids at Giza with the three stars Zeta Orionis, Epsilon Orionis and Delta Orionis, the stars forming Orion's Belt, in the relative positions occupied by these stars in 10500 BC. The authors argue that the geographic relationship of the Sphinx, the Giza pyramids and the Nile directly corresponds with Leo, Orion and the Milky Way respectively. Sometimes cited as an example of pseudoarchaeology, the theory is at variance with mainstream scholarship. The Sphinx water erosion hypothesis contends that the main type of weathering evident on the enclosure walls of the Great Sphinx could only have been caused by prolonged and extensive rainfall, and must therefore predate the time of the pharaoh Khafra. The hypothesis is championed by René Schwaller de Lubicz (1887–1961), who lived and studied Egyptology for 12 years in Egypt, and by Robert M. Schoch, a geologist and associate professor of natural science at the College of General Studies at Boston University, as well as by John Anthony West, an author and alternative Egyptologist. Colin Reader, a British geologist, studied the erosion patterns and noticed that they are found predominantly on the western enclosure wall and not on the Sphinx itself. He proposed the rainfall water runoff hypothesis, which also recognizes climate change transitions in the area. Author Robert K. G. Temple proposes that the Sphinx was originally a statue of the Jackal-Dog Anubis, the God of the Necropolis, and that its face was recarved in the likeness of a Middle Kingdom pharaoh, Amenemhet II. Temple bases his identification on the style of the eye make-up and style of the pleats on the headdress. Over the years several authors have commented on what they perceive as "Negroid" characteristics in the face of the Sphinx. This issue has become part of the Ancient Egyptian race controversy, with respect to the ancient population as a whole. ... the royal son, Thothmos, being arrived, while walking at midday and seating himself under the shadow of this mighty god, was overcome by slumber and slept at the very moment when Ra is at the summit [of heaven]. He found that the Majesty of this august god spoke to him with his own mouth, as a father speaks to his son, saying: Look upon me, contemplate me, O my son Thothmos; I am thy father, Harmakhis-Khopri-Ra-Tum; I bestow upon thee the sovereignty over my domain, the supremacy over the living ... Behold my actual condition that thou mayest protect all my perfect limbs. The sand of the desert whereon I am laid has covered me. Save me, causing all that is in my heart to be executed. 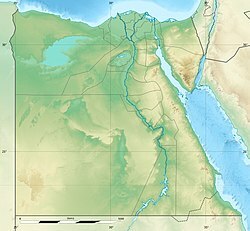 Mark Lehner, an Egyptologist who has excavated and mapped the Giza plateau, originally asserted that there had been a far earlier renovation during the Old Kingdom (c. 2686–2184 BC), although he has subsequently recanted this viewpoint. One of the people working on clearing the sands from around the Great Sphinx was Eugène Grébaut, a French Director of the Antiquities Service. In the beginning of the year 1887, the chest, the paws, the altar, and plateau were all made visible. Flights of steps were unearthed, and finally accurate measurements were taken of the great figures. The height from the lowest of the steps was found to be one hundred feet, and the space between the paws was found to be thirty-five feet long and ten feet wide. Here there was formerly an altar; and a stele of Thûtmosis IV was discovered, recording a dream in which he was ordered to clear away the sand that even then was gathering round the site of the Sphinx. In 1931 engineers of the Egyptian government repaired the head of the Sphinx. Part of its headdress had fallen off in 1926 due to erosion, which had also cut deeply into its neck. This questionable repair was by the addition of a concrete collar between the headdress and the neck, creating an altered profile. Many renovations to the stone base and raw rock body were done in the 1980s, and then redone in the 1990s. The one-metre-wide nose on the face is missing. Examination of the Sphinx's face shows that long rods or chisels were hammered into the nose, one down from the bridge and one beneath the nostril, then used to pry the nose off towards the south. Mark Lehner who performed an archaeological study concluded that it was broken with instruments at an unknown time between the 3rd and 10th centuries CE. 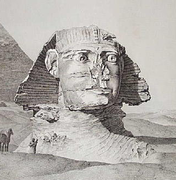 Drawings of the Sphinx by Frederic Louis Norden in 1757 showed the nose missing. Many folk tales exist regarding destruction of its nose. One tale erroneously attributes it to cannon balls fired by the army of Napoleon Bonaparte. Other tales ascribe it to being the work of Mamluks. Since 10th century, some Arab authors have also claimed it to be a result of iconoclastic attacks. The Arab historian al-Maqrīzī, writing in the 15th century, attributes the loss of the nose to by Muhammad Sa'im al-Dahr, a Sufi Muslim from the khanqah of Sa'id al-Su'ada in AD 1378, who found the local peasants making offerings to the Sphinx in the hope of increasing their harvest and defaced the Sphinx in an act of iconoclasm. According to al-Maqrīzī, many people living in the area believed that the increased sand covering the Giza Plateau was retribution for al-Dahr's act of defacement. Ibn Qadi Shuhba mentions his name as Muhammad ibn Sadiq ibn al-Muhammad al-Tibrizi al-Masri who died in 1384. He attributed the desecration of sphinxes of Qanatir al-Siba built by the sultan Baybars to him, and also said he might have desecrated the Great Sphinx. Al-Minufi stated that the Alexandrian Crusade in 1365 was divine punishment for a Sufi sheikh of the khanqah of Sa'id breaking off the nose. Residues of red pigment are visible on areas of the Sphinx's face. Traces of yellow and blue pigment have been found elsewhere on the Sphinx, leading Mark Lehner to suggest that the monument "was once decked out in gaudy comic book colors". Colin Reader has proposed that the Sphinx was probably the focus of solar worship in the Early Dynastic Period, before the Giza Plateau became a necropolis in the Old Kingdom (c. 2686–2134 BC). He ties this in with his conclusions that the Sphinx, the Sphinx temple, the Causeway and the Khafra mortuary temple are all part of a complex which predates Dynasty IV (c. 2613–2494 BC). The lion has long been a symbol associated with the sun in ancient Near Eastern civilizations. Images depicting the Egyptian king in the form of a lion smiting his enemies date as far back as the Early Dynastic Period. In the New Kingdom, the Sphinx became more specifically associated with the god Hor-em-akhet (Hellenized: Harmachis) or "Horus-at-the-Horizon", which represented the pharaoh in his role as the Shesep-ankh (English: Living Image) of the god Atum. Pharaoh Amenhotep II (1427–1401 or 1397 BC) built a temple to the north east of the Sphinx nearly 1000 years after its construction, and dedicated it to the cult of Hor-em-akhet. Some ancient non-Egyptians saw it as a likeliness of the god Horon. The cult of the Sphinx continued into the medieval times. The Sabians of Harran saw it as the burial place of Hermes Trismegistus. 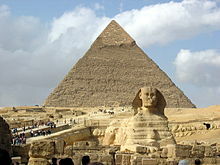 Arab authors described the Sphinx as a talisman which guarded the area from the desert. Al-Maqrizi describes it as the "talisman of the Nile" on which the locals believed the flood cycle depended on. Muhammad al-Idrisi stated that those wishing to obtain bureaucratic positions in the Egyptian government gave incense offering to the monument. In the last 700 years, there has been a proliferation of travellers and reports from Lower Egypt, unlike Upper Egypt, which was seldom reported from prior to the mid-18th century. Alexandria, Rosetta, Damietta, Cairo and the Giza Pyramids are described repeatedly, but not necessarily comprehensively. Many accounts were published and widely read. These include those of George Sandys, André Thévet, Athanasius Kircher, Balthasar de Monconys, Jean de Thévenot, John Greaves, Johann Michael Vansleb, Benoît de Maillet, Cornelis de Bruijn, Paul Lucas, Richard Pococke, Frederic Louis Norden and others. But there is an even larger set of more anonymous people who wrote obscure and little-read works, sometimes only unpublished manuscripts in libraries or private collections, including Henry Castela, Hans Ludwig von Lichtenstein, Michael Heberer von Bretten, Wilhelm von Boldensele, Pierre Belon du Mans, Vincent Stochove, Christophe Harant, Gilles Fermanel, Robert Fauvel, Jean Palerne Foresien, Willian Lithgow, Joos van Ghistele, etc. It is the antiquity of the Sphinx which thrills us as we look upon it, for in itself it has no charms. The desert's waves have risen to its breast, as if to wrap the monster in a winding-sheet of gold. The face and head have been mutilated by Moslem fanatics. The mouth, the beauty of whose lips was once admired, is now expressionless. Yet grand in its loneliness, – veiled in the mystery of unnamed ages, – the relic of Egyptian antiquity stands solemn and silent in the presence of the awful desert – symbol of eternity. Here it disputes with Time the empire of the past; forever gazing on and on into a future which will still be distant when we, like all who have preceded us and looked upon its face, have lived our little lives and disappeared. From the 16th century far into the 19th century, observers repeatedly noted that the Sphinx has the face, neck and breast of a woman. Examples included Johannes Helferich (1579), George Sandys (1615), Johann Michael Vansleb (1677), Benoît de Maillet (1735) and Elliot Warburton (1844). Most early Western images were book illustrations in print form, elaborated by a professional engraver from either previous images available or some original drawing or sketch supplied by an author, and usually now lost. Seven years after visiting Giza, André Thévet (Cosmographie de Levant, 1556) described the Sphinx as "the head of a colossus, caused to be made by Isis, daughter of Inachus, then so beloved of Jupiter". He, or his artist and engraver, pictured it as a curly-haired monster with a grassy dog collar. 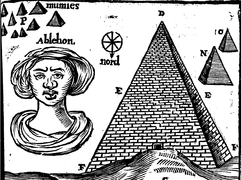 Athanasius Kircher (who never visited Egypt) depicted the Sphinx as a Roman statue, reflecting his ability to conceptualize (Turris Babel, 1679). Johannes Helferich's (1579) Sphinx is a pinched-face, round-breasted woman with a straight haired wig; the only edge over Thévet is that the hair suggests the flaring lappets of the headdress. 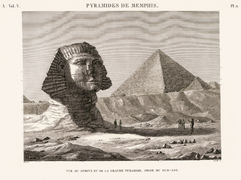 George Sandys stated that the Sphinx was a harlot; Balthasar de Monconys interpreted the headdress as a kind of hairnet, while François de La Boullaye-Le Gouz's Sphinx had a rounded hairdo with bulky collar. Richard Pococke's Sphinx was an adoption of Cornelis de Bruijn's drawing of 1698, featuring only minor changes, but is closer to the actual appearance of the Sphinx than anything previous. 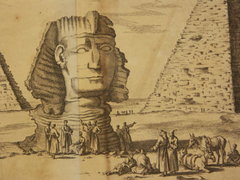 The print versions of Norden's careful drawings for his Voyage d'Egypte et de Nubie, 1755 are the first to clearly show that the nose was missing. However, from the time of the Napoleonic invasion of Egypt onwards, a number of accurate images were widely available in Europe, and copied by others. 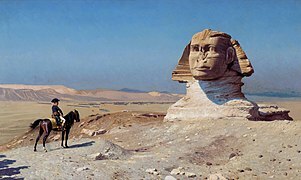 Mystery of the Sphinx, narrated by Charlton Heston, a documentary presenting the theories of John Anthony West, was shown as an NBC Special on 10 November 1993. A 95-minute DVD, Mystery of the Sphinx: Expanded Edition, was released in 2007. Age of the Sphinx, a BBC Two Timewatch documentary presenting the theories of John Anthony West and critical to both sides of the argument, was shown on 27 November 1994. In 2008, the film 10,000 BC showed a supposed original Sphinx with a lion's head. Before this film, this lion head theory had been published in documentary films about the origin of the Sphinx. 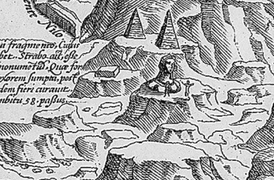 Hogenberg and Braun (map), Cairus, quae olim Babylon (1572), exists in various editions, from various authors, with the Sphinx looking different. ^ Early Egyptologists were inconsistent in their transliteration of pharaonic names: Khafre and Khephren are both references to Khafra. ^ a b "The Great Sphinx of Giza". Ancient History Encyclopedia. Retrieved 2016-12-07. ^ Sims, Lesley (2000). "The Great Pyramids". A Visitor's Guide to Ancient Egypt. Saffron Hill, London: Usborne Publishing. p. 17. ISBN 0-7460-30673. ^ "Saving the Sphinx — NOVA | PBS". www.pbs.org. Retrieved 2016-12-07. ^ Rigano, Charles (2014). Pyramids of the Giza Plateau. p. 148. ISBN 9781496952493. ^ a b Zuberbühler, Franz Löhner, Teresa. "Stone quarries in ancient Egypt. Details about the Giza quarries, the granite quarries in Assuan and the Tura limestone quarries". www.cheops-pyramide.ch. Retrieved 2016-12-08. ^ "How old is the Sphinx?". msnbc.com. 1999-02-11. Retrieved 2016-12-07. ^ a b "The Great Sphinx | Geology of a Statue | Dating the Sphinx | Ancient Egypt Research Associates". www.aeraweb.org. Retrieved 2016-12-08. ^ Zivie-Coche, Christiane (2002). Sphinx: History of a Monument. Cornell University Press. pp. 99–100. ISBN 978-0-8014-3962-9. ^ Hawkes, Jacquetta (1974). Atlas of Ancient Archaeology. McGraw-Hill Book Company. p. 150. ISBN 0-07-027293-X. ^ "sphinx | mythology". Encyclopædia Britannica. Retrieved 2016-12-07. ^ "Sphinx Project: Why Sequence is Important". 2007. Archived from the original on July 26, 2010. Retrieved February 27, 2015. ^ Lehner, Mark (Spring 2002). 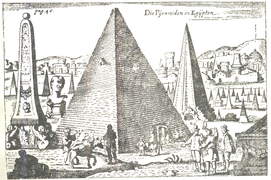 "Giza As Is:Unfinished Business Reveals the Human Hand" in Aeragram, 5:2 (Spring 2002), 10–14. Retrieved 23 December 2008. ^ "Sphinx - Khafre's Giza Monuments as a Unit - Mark Lehner - Ancient Egypt Research Associates". www.aeraweb.org. Retrieved 23 October 2017. ^ a b Evan Hadingham (February 2010). "Uncovering Secrets of the Sphinx". Smithsonian Magazine. ^ Colavito, Jason (2001). "Who Built the Sphinx?" at Lost Civilizations Discovered. Retrieved 19 December 2008. ^ Hawass, Zahi. (The Khufu at The Plateau. Retrieved 6 January 2009. ^ a b c Colin, Reader (2002). "Giza Before the Fourth Dynasty". Journal of the Ancient Chronology Forum. 9. pp. 5–21. Archived from the original on December 10, 2013. Retrieved October 11, 2017. ^ Verner, Miroslav (2007). The Pyramids: The Mystery, Culture, and Science of Egypt's Great Monuments. Grove/Atlantic Inc. p. 212. ISBN 978-0802198631. ^ Jánosi, Peter (1996). Die Pyramidenanlagen der Königinnen (= Denkschriften der Gesamtakademie, Österreichische Akademie der Wissenschaften, volume 13. pp. 11, 125. ISBN 978-3700122074. ^ "Giza Sphinx & Temples Page 3 - The Great Sphinx - Spirit & Stone". Theglobaleducationproject.org. Retrieved May 15, 2014. ^ Wallis Budge, E. A. (1904). The Gods of the Egyptians: Studies in Egyptian Mythology. Courier Dover Publications. ISBN 978-0-486-22055-0. ^ a b c Fleming, Nic (2004-12-14). "I have solved riddle of the Sphinx, says Frenchman" in The Daily Telegraph. Updated 14 December 2004. Retrieved 28 June 2005. ^ Taylor, Karen T., History of the IAI Forensic Art Discipline at the International Association for Identification. Retrieved 5 January 2009. ^ Orser, Charles E. (2003). Race and practice in archaeological interpretation. University of Pennsylvania Press. p. 73. ISBN 978-0-8122-3750-4. ^ Hancock, Graham; Bauval, Robert (1997). The Message of the Sphinx: A Quest for the Hidden Legacy of Mankind. Three Rivers Press. p. 271. ISBN 978-0-517-88852-0. ^ Schoch, Robert M. (1992). Redating the Great Sphinx of Giza. Archived from the original on 2016-02-04. Retrieved October 11, 2017. ^ Reader, C. D. (February 2001). "A Geomorphological Study of the Giza Necropolis, with Implications for the Development of the Site". Archaeometry. 43 (1): 149–165. doi:10.1111/1475-4754.00009. ^ Mallet, Dominique, The Stele of Thothmes IV: A Translation, at harmakhis.org. Retrieved 3 January 2009. ^ "The ARCE Sphinx Project—A Preliminary Report". Hall of Maat. Retrieved May 26, 2009. ^ "'Khufu Knew the Sphinx' by Colin Reader". Ianlawton.com. Archived from the original on August 2, 2009. Retrieved May 26, 2009. ^ "A Brief History of the Supreme Council of Antiquities (SCA): 1858 to present". SCA - Egypt. Archived from the original on 2016-10-17. Retrieved 2017-03-21. ^ Rappoport, S. (2005-12-17). The Project Gutenberg EBook of History Of Egypt From 330 B.C. To The Present Time, Volume 12 (of 12), by S. Rappoport. The Grolier Society Publishers, London. Archived from the original on 4 March 2016. Retrieved 31 October 2016. ^ "Filmed in 1897, THIS is the OLDEST footage of the Great Sphinx of Giza - Ancient Code". www.ancient-code.com. 2017-04-17. Retrieved 23 October 2017. ^ Hawass, Zahi. "HISTORY OF THE CONSERVATION OF THE SPHINX". Retrieved 23 October 2017. ^ Lehner, Mark (1997). The Complete Pyramids. Thames & Hudson. p. 41. ISBN 978-0-500-05084-2. ^ "F.L. Norden. 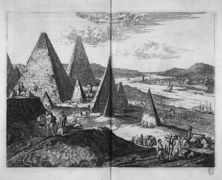 Travels in Egypt and Nubia, 1757. Plate 47, Profil de la tête colossale du Sphinx". Brooklyn Museum. Retrieved January 24, 2014. ^ Joseph E Lowry; Shawkat M Toorawa; Everett K Rowson (2017). Arabic Humanities, Islamic Thought: Essays in Honor of Everett K. Rowson. Boston Brill. p. 264. ISBN 9789004343245. OCLC 992515269. Retrieved October 11, 2017. ^ "British Museum - Fragment of the beard of the Great Sphinx". britishmuseum.org. Archived from the original on 2015-10-27. ^ Reader, Colin (2000-03-17). Further considerations on the Age of the Sphinx Archived 2015-06-02 at the Wayback Machine at Rational Spirituality. Retrieved 6 January 2009. ^ Joseph E Lowry; Shawkat M Toorawa; Everett K Rowson (2017). Arabic Humanities, Islamic Thought: Essays in Honor of Everett K. Rowson. Boston Brill. p. 263. ISBN 9789004343245. OCLC 992515269. Retrieved October 11, 2017. ^ "John L. Stoddard's Lectures". 2. 1898: 111. 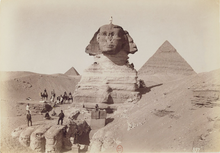 Wikimedia Commons has media related to Great Sphinx of Giza. This page was last edited on 14 April 2019, at 13:09 (UTC).